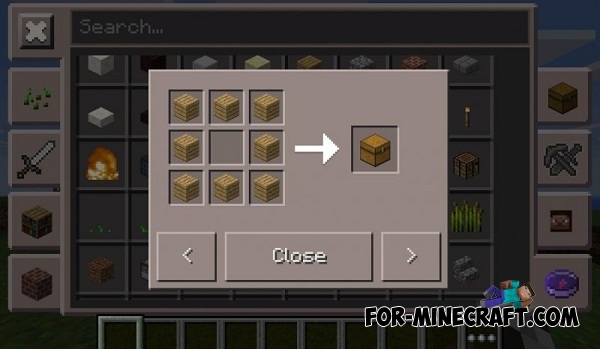 Toolbox (TooManyItems) is a popular mod for Minecraft PE which facilitates the survival or your regular game. 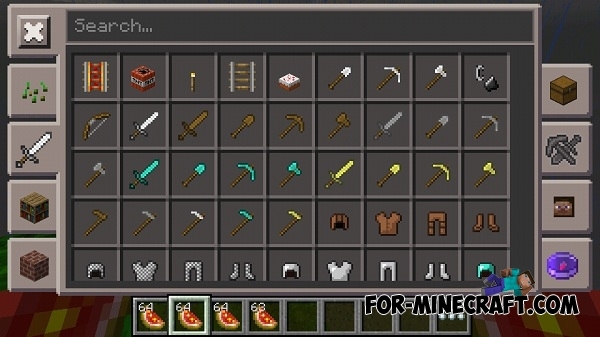 This mod (addon) will adds a lot of features to the game, but my favorite is an opportunity to look the item recipes. Additionally, Toolbox supports items from different mods, it's really pleasant. To see all the available commands use /help. Command list expands and Toolbox updates can contain new commands. The main tool is a wand. With it you can edit absolutely any area in the game. How to use the wand? It's very simple, just choose the first position and then the second. These positions must contain inside (diagonal) all the blocks necessary for you. Then use the available text commands. For example, you can replace the selected area on the stone. Thus, the WorldEdit allows you to quickly change the world for any purpose. You can prepare the ground for buildings in a matter of seconds. With the help of mini-map you can always find the way to home! Map tags will help you in this even more! 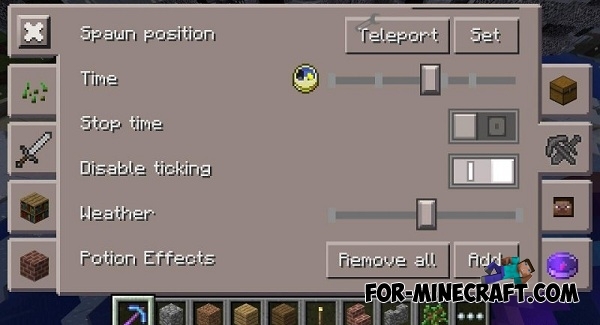 You can enable the mini-map in the "Modification -> Show mini-map". There you can configure its size, activate the coordinates, and others. After that, the tags will appear automatically in the world and you will see this tags at any distance, it will display the distance to the player (number of blocks), that is very useful! 1. Download the app using the links below (the latest version) and install as a normal Android app. 2. Enable support for add-ons in settings. 3. If you want to use the launcher functions then run "ToolBox for .." app and there click on the "Continue". 4. The app is installed, an enjoyable game! Support for Minecraft PE 1.10.0 Release and 1.11 Betas. 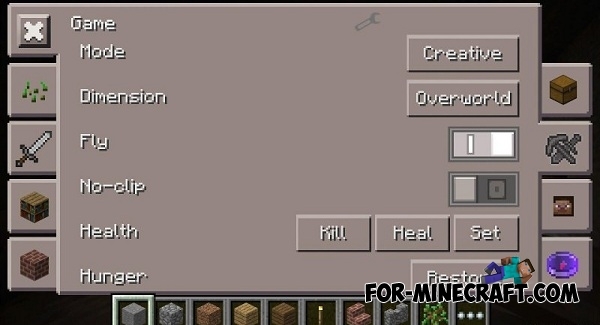 Support for Minecraft PE 1.7/1.8. 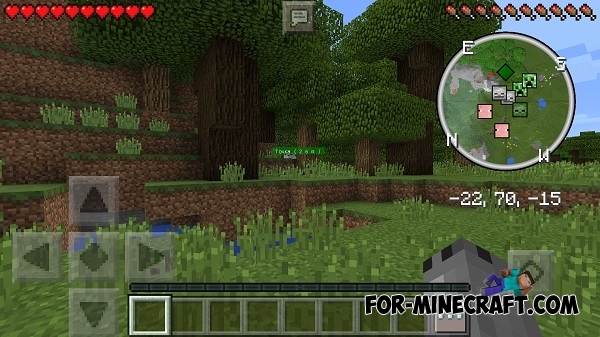 Support for Minecraft PE 1.4. (1.4.2 also). Quick add and bug fixes. The update includes a lot of new, but we will list the main thing. 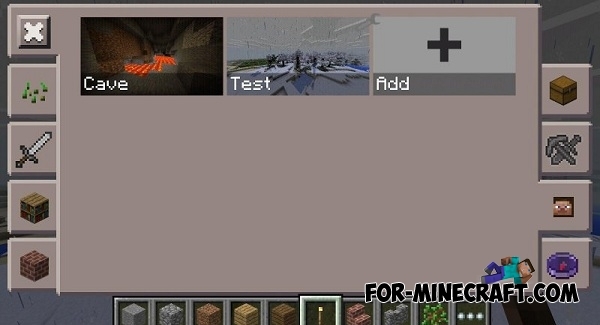 Works on MCPE 1.1 including the latest beta version. Supports PE 1.0.9. Toolbox for PE 1.1.X will appear after BlockLauncher for 1.1 is released. Support for MinecraftPE 1.0.2 / 1.0.3. Support for MCPE 1.0 Release (0.17.X). Bug fixes: When using //set command, incorrect crafting recipes, and more. Support for the latest beta version (MCPE 0.17.0). Support for Minecraft PE 0.16.2 and 0.17.0 Beta Build 2! A small update contains fixes with ModPE methods. 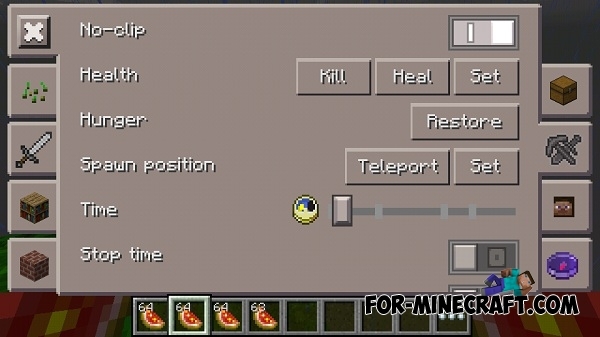 Added the ability to use the WorldEdit. With it you will be able to change the world as you want (more on that above). Toolbox for MCPE 0.16.0 will be after finishing the beta test. Damage and saving inventory indicators. If you do not have Bloklauncher, then start the Toolbox as an application. 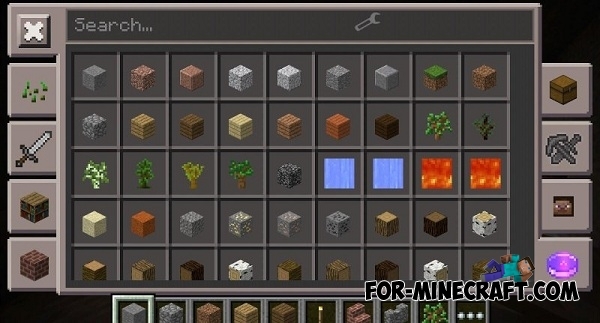 Support for Minecraft PE 0.14.1. X-Ray, debug screen, fast cutting of wood, armor status. If you play with the Toolbox addon using the Blocklauncher and you dont have «M» button, then just go to the launcher (menu of your applications) and enable permission to use the Toolbox together with Blocklauncher. Perhaps it should be done only for the owners of Android 6.0! 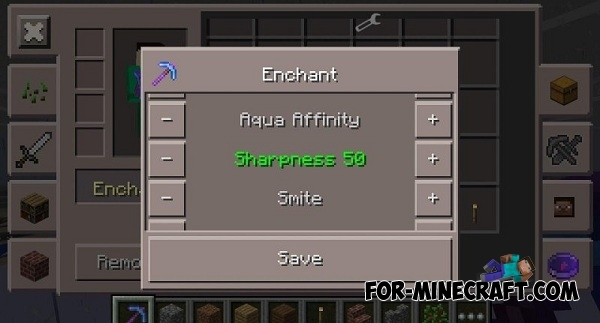 The long-awaited update of the popular mod / addon (TooManyItems, TMI), which allows you to instantly adds items, browse recipes, potions effects, change the game mode, HP, time, weather, enchant items, set the spawn, and more! Support for Minecraft PE 0.14.0! The addon is now working as a single launcher, but it will work in Blocklauncher without problems. 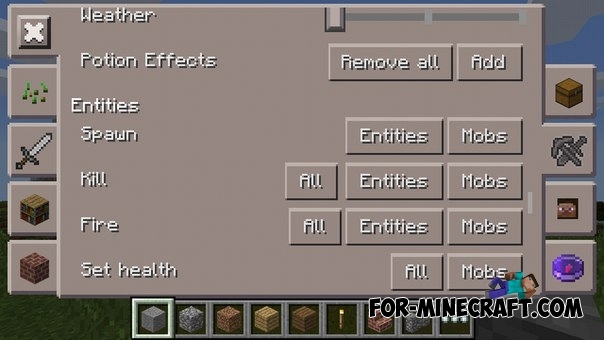 The popular addon for Minecraft Pocket Edition 0.13.0/0.13.1 - ToolBox (analogue of TooManyItems)! Change the game mode in one click, add the your desired item, change the time of day and weather, and more! Added slider to change the speed of the game. Fixed bugs of the interface on a device with a small screen. 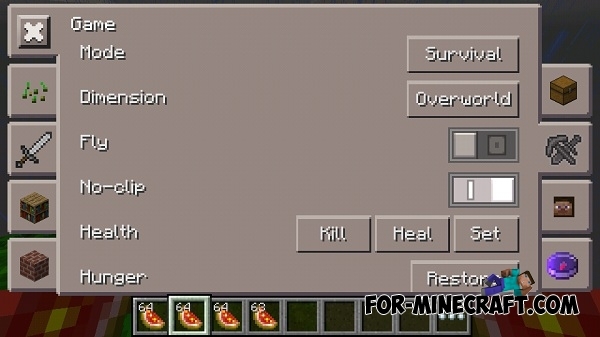 Fixed Option "hide the button of addon". 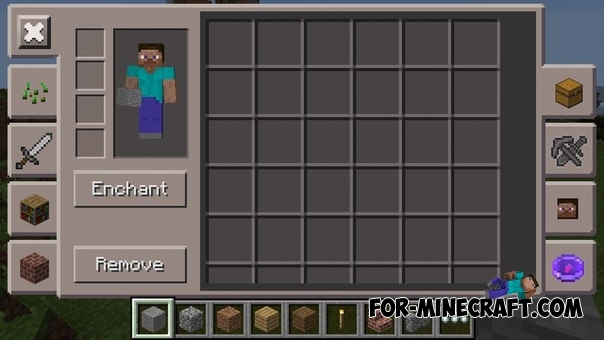 The ability to quickly add the necessary item or a block in your inventory. The ability to change the game mode. To set the point for the teleportation. The ability to change the day or night. Adding and removing creatures, the possibility of setting fire to creatures. X-ray - removed in v17, because Mojang was deleted one important function. The ability to paint the grass using dyes. Ride on pigs using the saddle and fishing rods! 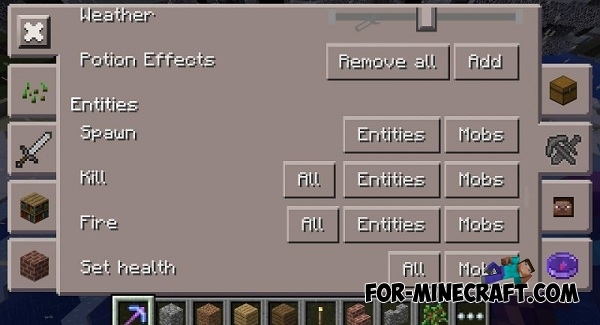 Not Enough Items mod for Minecraft PE 0.11/0.12/0.13/0.14.0«NEI» mod adds a several new and useful features. Mod similar to TMI, but the features it has much more.